During his address, Director General of SESRIC presented an overview of current trends and developments in the OIC Member Countries in the fields of education, scientific research, and science & technology, focusing on scientific publications and university rankings as two major indicators of performance at higher education and scientific research. Dr. Alpay, touched upon key determining factors of the performance of OIC Member Countries and showed their stand in the world with respect to these factors where he also provided an analysis of student-teacher ratio at tertiary schools, enrolment rate at tertiary schools, and public expenditure for tertiary education as three key factors that are crucial for better education at universities and advanced scientific research. Dr. Alpay concluded his presentation by underlining some broad policy implications as well as touching upon the fundamental need for more public and private resources allocated to higher education. He also stressed upon the idea of promoting academic research by improving living standards for scientists in order to reduce the OIC countries’ brain drain to the West, as well as providing grants and minimizing teaching loads. 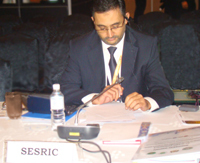 He also stated that in order to stimulate R&D and reach the 1% target of R&D share in GDP in the foreseeable future, as set by the OIC Ten-Year Programme of Action in 2005 and as adopted by the Heads of States and Governments, Governments should encourage research joint ventures among companies in OIC Member Countries and take advantage of R&D spillovers by learning about other countries’ new technologies, and by importing technological goods and services from their trade partners. During the opening ceremony of the Conference, H.E. Tan Sri Dato’ Haji Muhyiddin Haji Mohd Yasin, the Deputy Prime Minister of Malaysia, pointed out that quality higher education should provide broader contribution such as social cohesion, better health, character-moulding. He added that the development of critical and creative faculties were much more essential for learning societies in a rapidly changing world rather than reducing the role of education to factory. H.E. Muhyiddin also mentioned that quality education could become part of our culture through enhancement of individual potential, recognition of cultural diversity, lifelong learning, and experience gained by learners. He expressed his hope of achieving holistic education and addressing equity of access to all. H.E. Ekmeleddin İhsanoğlu, Secretary General of the OIC, in his statement during the opening ceremony, stated that we must not forget that the ultimate goal of all development plans revolves around improving the quality of life of our people who have the right to expect a fair and equitable access to basic needs such as water, education, health care, food and shelter. He further stated that our strategies in the field of science and technology therefore should be directed according to the change in the daily lives of our people. Direct socioeconomic benefits for the people would lead to greater recognition and awareness about the value of learning, research and innovation. Hon. Dato’ Seri Mohamed Khaled Nordin, Minister of Higher Education of Malaysia, in his opening statement stated that the Fifth Islamic Conference of Ministers of Higher Education and Scientific Research (ICMHESR) was an excellent platform for all parties to identify emerging trends and technologies that are of excellent quality and that such quality could be incorporated into their organisations’ requirements. He also urged the participants to pool resources and work together to invigorate the Islamic educational agenda, and to reclaim the glorious standing of the great universities of Cordoba and Alexandria which reigned supreme in the early years of Islam. Dr. Abdelaziz Othman Altwaijri, Director General of Islamic Educational, Scientific and Cultural Organization gave a presentation during the Fifth Session on the theme "Enculturation of Quality in Academia, Research and Innovation towards Prosperity of Ummah". His presentation focusedon important initiatives to improve quality in higher education, research performance and innovation in advanced and emerging technologies. He added that such initiatives would also give due consideration to empowering women in scientific, technological, economic and social development, so as to tap this huge potential and resource towards economic progress. Finally, he concluded his presentation by saying that combined vision would help to adopt a strategic vision of science and higher education in the Islamic countries. The Fifth ICMHESR reviewed and assessed the reports of the Director General of ISESCO and the report of the Secretary General of the Organisation of the Islamic Conference on the issues and challenges facing the OIC Member Countries in their efforts to overcome the common obstacles deterring their progress towards scientific and technological excellence. Among other agenda items, the Conference also reviewed the progress made in two collaborative projects in which the Centre had actively partaken and participated, namely University Ranking and Atlas of Islamic World Innovation. The Islamic Conference of Ministers of Higher Education and Scientific Research (ICMHESR) in Kuala Lumpur is the fifth of such conference carrying on the tradition of cooperation and collaboration among OIC Member Countries. The theme of the Fifth Conference was ‘Enculturation of Quality in Academia, Research and Innovation towards Prosperity of Ummah’. Besides its regular agenda, the Conference witnessed a round table discussion entitled ‘Empowering Women for Scientific and Technology Development in Islamic Countries’.